D’Avignon radishes, otherwise known as French Breakfast radishes, are much more than a fantastic salad topping. Both their brightly colored bulbs and their slightly fuzzy green tops are edible and give quite a taste-punch. For those who balk at their acerbic bite when raw, heating up these beauties renders the flavor much more mellow. 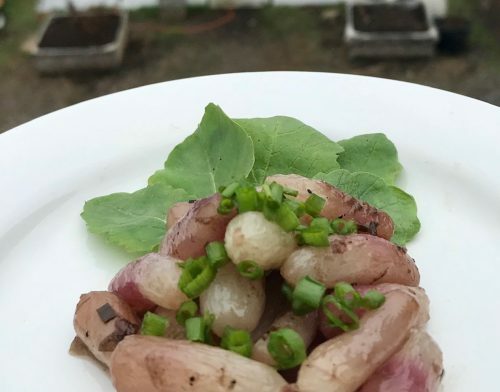 While radishes are lovely when roasted with other root vegetables, sauteéd with their greens thrown in at the last minute to wilt, or sliced thinly and made into radish chips, this week’s recipe focuses on braising radishes. In braising a fat such as butter, vegetable, or coconut oil is used to start cooking the radish roots, then they are bathed in a liquid that is reduced before serving. You can garnish the dish with parsley or use the minced green radish tops to add some extra color. Melt the butter in a large skillet over medium-high heat until it just begins to brown, 3 to 4 minutes. Add the onion, and lower heat to medium. Cook 3 minutes until the onion softens. Add the radishes, salt, and pepper to taste. Stir in the water. Raise heat to high until it boils, then cover and lower heat to simmer. Cook, stirring occasionally, for 20 minutes or until radishes are tender. Uncover and raise heat to high.